Peonies are large, lovely, luscious flowers. They are surprisingly hardy and easy care also. Being planted in the correct location and given a little attention, most peonies will grow happily in the same spot for many years becoming one of those special plants by which the garden is remembered long afterwards. The site should be sunny and well drained. (Exception: 'Early Windflower' makes a good woodland peony.) Although a deep fertile soil is best, peonies can still do well in quite poor soils, as long as it never becomes water-logged (especially in winter). Allow an area of one square meter when fully grown (i.e. about 3 years). Peonies resent trees or shrubs being too close to them, or even overhanging branches. This is probably the most common reason for failure to thrive. Small annuals close to them are all right initially. 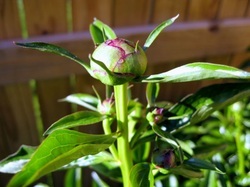 For herbaceous peonies plant the buds upwards at a depth of 5 cm (2") and the storage roots sloping gently downwards. The depth is measured carefully from the base of the uppermost buds not from the top of the bud. The correct planting depth is very important. If it is too deep then the bud will be excessively insulated from the cold from above and it will also be slower to come out of the ground. It is very easy to accidently plant it too deep if just doing it by eye and not measuring it. What's more, as the loosened soil settles down in due course, or if the ground above is stamped flat after planting, the planted root can sink lower than intended. Cultivation is probably the best form of weed control. Bark mulches can be used but straw and compost probably increase the risk of botrytis. A general garden fertiliser may improve colour and size of blooms, but avoid excessive nitrogen which may increase susceptibility to fungal disease. A potato fertiliser high in phosphate and potassium and low in nitrogen would be suitable. Contrary to popular perception peonies are not gross feeders. Many peonies grow well with no added fertiliser. If compost is added, keep it well away from the crown of the plant. Watering, even in dry climates, is seldom needed if planted at the correct time. Some varieties need to be staked for a good garden display. Botrytis (grey mould) is the most common disease of peonies and this can be sprayed for with a fungicide in the spring. It causes blackening of leaves, and patches of stems rot, often just at or below ground level. Fungicides used against botrytis include Captan, Scala, Switch, Euparen, Defence (=Rovral). For the home gardener, careful removal of diseased parts as they occur can help control the disease. Herbaceous peonies die down every Autumn. Different varieties pop up through the ground in spring at different times. Do not panic if one variety is three or four weeks later than another. Most varieties flower in New Zealand from late October to early December. Do not expect too much in the first year. There may be only one or two stems, which will often be shorter, and the flowers may be absent, small or atypical. In the first year, do not cut the stem off for cut flowers, since stems do not regrow during the season, and the leaves are required for building up strength for the following year. Most varieties make excellent cut flowers but, like roses, are best cut in the bud stage (when soft but not opened). When mature (usually by the third or sometimes fourth year), do not cut more than about a third or at most half the stems for cut flowers. If the cut stems are short, leaving more leaves on the bush, then probably more stems can be cut and vice versa. Disbudding side buds will increase the size of the main flower. Alternatively, leaving the side buds prolongs the flowering display time. Several causes for failure of peonies to bloom satisfactorily are: too deep planting, the variety, shading, diseases (such as botrytis and viruses) and insects (thrips). If your peonies have been planted too deep, you may hurry along the flowering time by resetting them, but if they have been in place several years, they may be nearly ready to bloom since the plant "lifts" itself a little each year as it grows. A few varieties of peonies are noted for their poor flower production. These may develop large buds that expand but refuse to open if weather is not perfect. Shade from buildings or trees may result in weak plants that fail to produce flowers or may bloom sparsely. If this is the problem, select a new site in full sun. Shade that did not exist at planting time could develop over a 20 year period, gradually creating problems with reduced blooms over the past few years. Botrytis blight is caused by a fungus that over-winters on dead peony leaves, stems and roots. The easiest control is sanitation by completely removing the plant tops (bury or burn them) in autumn. Some virus diseases may stunt and deform the growth of your peonies and cause a gradual decline. Each year the plant becomes shorter, somewhat discoloured, and may fail to bloom. Remove such plants and destroy them. Certain insects such as thrips can cause flowers to become deformed and not open. Apply the appropriate insecticide if thrip activity is noted, following label instructions.